Last week I received the Stylish Blogger Award from Jackie at I Love to Read|Write|Share Knowledge. Thanks for the cool award. My favorite restaurant is Hollywood & Vine at Disney’s Hollywood Studio. I think Vancouver is the coolest place I’ve been. Continental Airlines once set my bag on fire and blamed me for it. They told the Big Guy that I must have done it when I checked the bag. They wanted us to believe that somehow a smoldering bag was checked, cleared security, changed planes and in their possession for 8 hrs without being noticed or bursting into flames. My favorite number is 77. I think books are powerful. I’ve been trying to use my blog to make a difference. 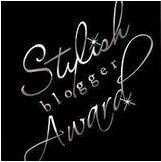 Pass this award to other stylish bloggers.